I’m going for 29 and cloudy. Access currently has a bit of a ridge/ squeeze. 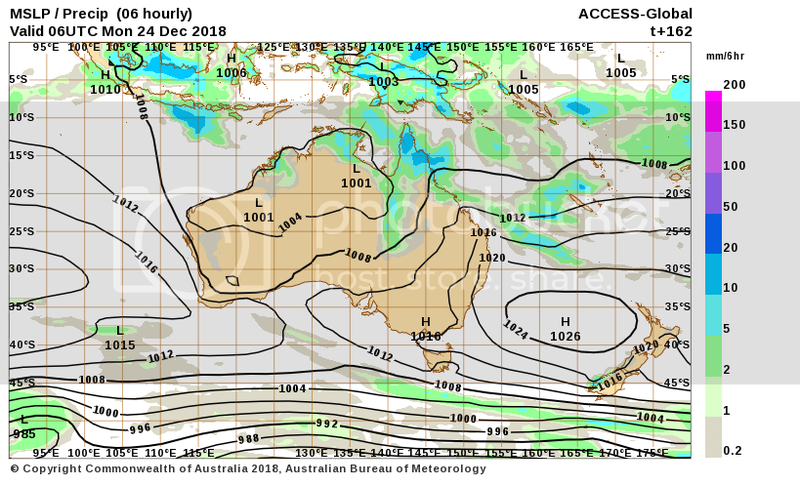 Noticing that that ACC map looks to have what looks like an INVEST in the coral sea up there east of the peninsula. I'll through a novice guess up. ESE winds, 28-30 degrees with a possible shower. Ooh and of course, lots of Jimmy, I know that part will be accurate. 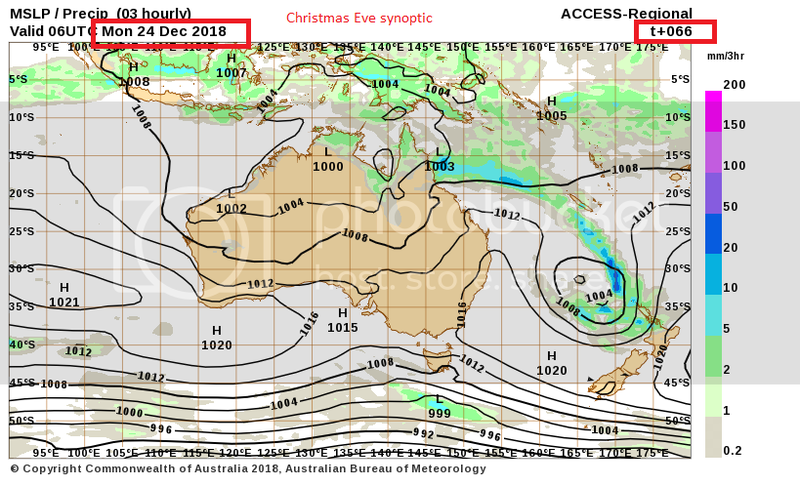 Christmas eve 24th DEC..is appearing on the 7 day ACCESS forecast for Australia. I like to put the model on the table how see how it performs. It is well known that the further out a forecast the less accurate so keep that in mind of course. ok. amazing the brain still working. any tips on uploading photo please .. l forgot? some may read that a bit differently. so lets see how she goes. I thought it was only for our backyard, but well done Crikey, that's the stuff I like to see and understand. Actually , my mistake DD.. It is for SE qld and NSW..
No probs.. I am sure each state will do there own. Having probs with my old photobucket . and posting on WZ. Nice to see you back. I used to follow your blog. Stay off photobucket Crikey its no good. Most of us are using flickr or imgur or dropbox I think. Oh hello yep.. It is so good to see that all the forum members from 3 yrs ago are still here. Kudos to you all. Haven't been on the blog yet.. It must be a mess. Unattended blog arghh! Looking about low 22 deg c for the tweed . I will be very happy if that pans out for Christmas cooking. Does an easterly sea breeze keep the temps down on the coast? 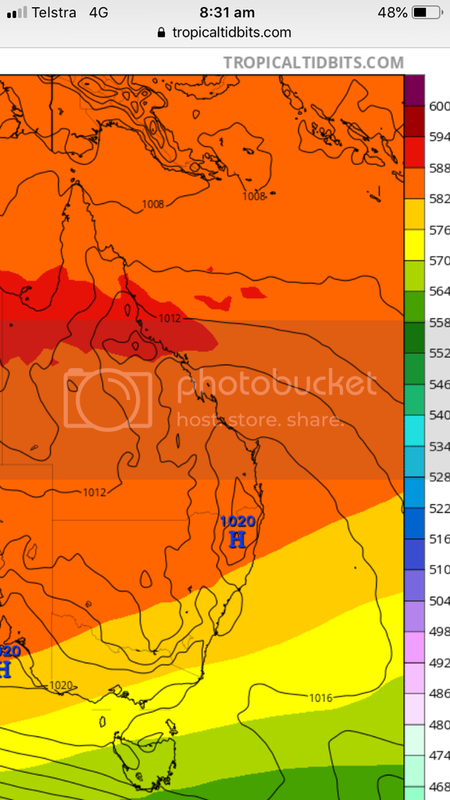 Gee theres some hot temps forecast near the NW WA !! I thought Tassie would be hotter with a north westerly but for some reason temp maps showing a nice cool 18 deg. 3 days in l will have a nother look and so how ACCESS has shifted on this. My good computer is in VIC and it could be months before l go back down. That is if l have my way.. I will investigate those other sites you have suggested. Certainly looking like a ridge set up for this period. This weekend coming looks like the last of any instability. 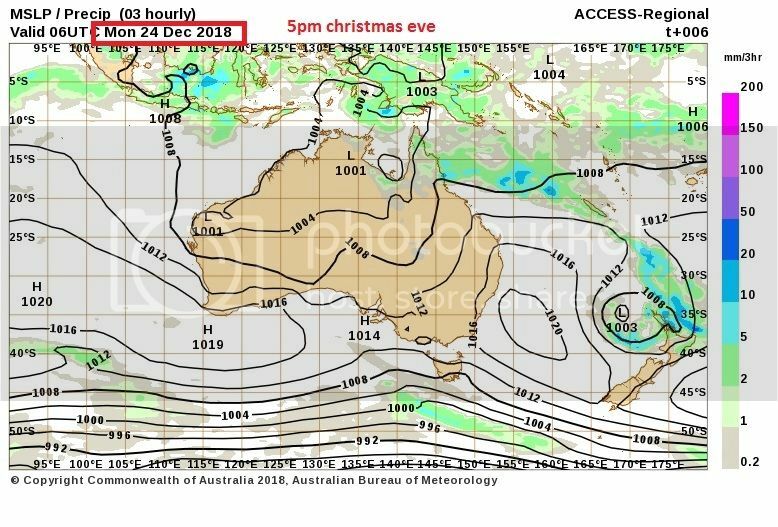 I'd probably sway to more of a stable weather for xmas day not sure about any cloud but judging by the synoptics I will go for top of 32c, winds ESE'ly mostly sunny. High chance of xmas spirits. Nice use of new terminology crikey...lol. 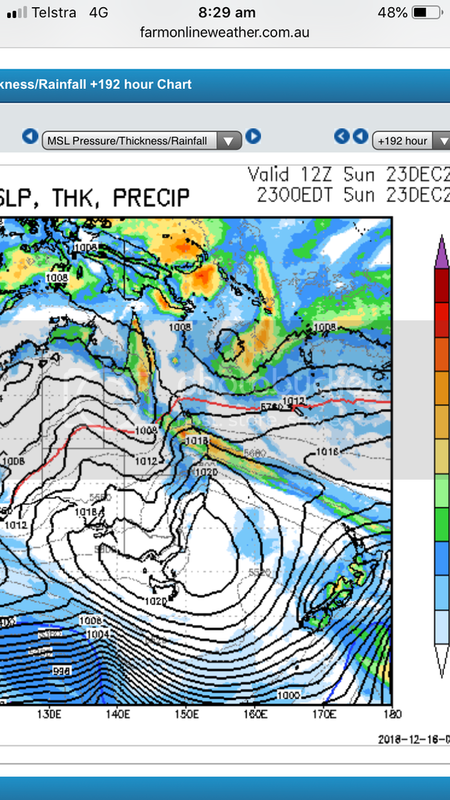 I'll go for 28 degrees and sunny with a 10Knot SE breeze on Xmas day for us. "Perth is set to experience its hottest Christmas Day in six years with a sunny day and a top of 34 degrees Celsius expected. 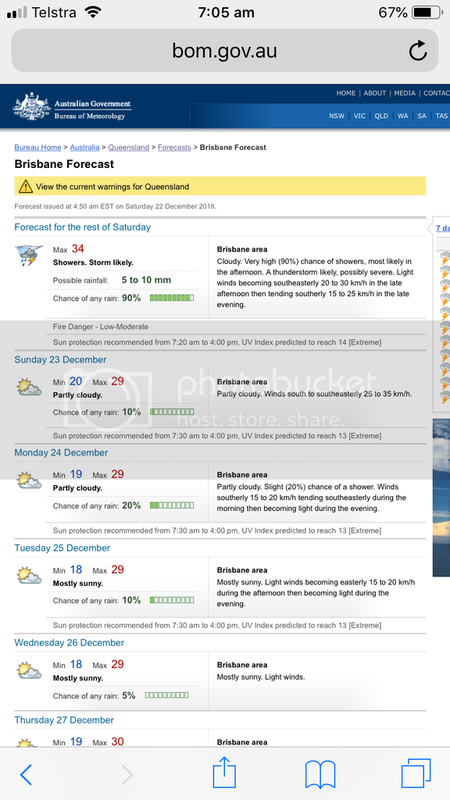 If it does get to the forecast maximum, it will be the hottest Christmas since 2012, when 39.6C was recorded. 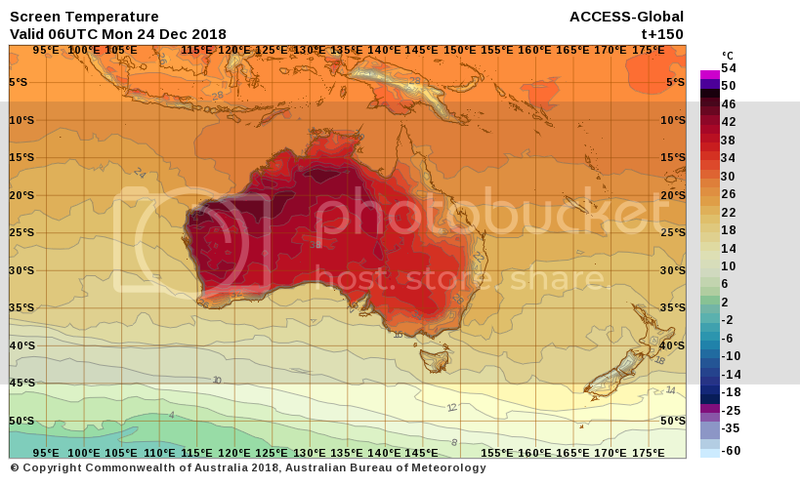 "Alice Springs Airport may challenge its December heat record during the next couple of days as temperatures soar in central Australia." We are now about 3 days away from Christmas eve and ACCESS r higher resolution is available. The forecast 3 days out is holding out very well. Looking like a snap from the 7 day forecast .